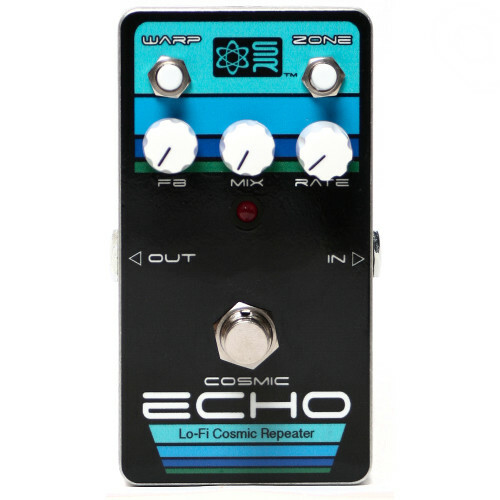 The Cosmic ECHO is an analog sounding lofi delay that will work with just about anything you plug into it. The dark, lush, moody tones of the ever-popular PT2399 IC provide an out-of-this-world experience. Our take on this classic pedal pushes the chip’s limits so you can explore all the gritty elements drifting at the edge of long delay rates. It already outperforms other bucket brigade style echoes, but just to be sure, we added 2 momentary switches, Zone and Warp. – Contains PT2399 IC, a bucket brigade style emulation. This IC has 16-bit sampling for 30-300 milliseconds. After that, the sample rate goes down in relation to the delay length. This results in artifacts and noise being introduced into the audio for weird, cosmic, psychedelic sounds. – 3 knobs: Feedback, Mix and Rate. The Mix is a Wet only control that attenuates the amount of delayed signal in the signal chain. The Feedback controls the number of repeats in an organic-sounding way. – Warp button. Momentary pushbutton switch that gives a bright, “small” speaker tone. – Zone button. Momentary pushbutton switch that introduces feedback into the circuit momentarily. 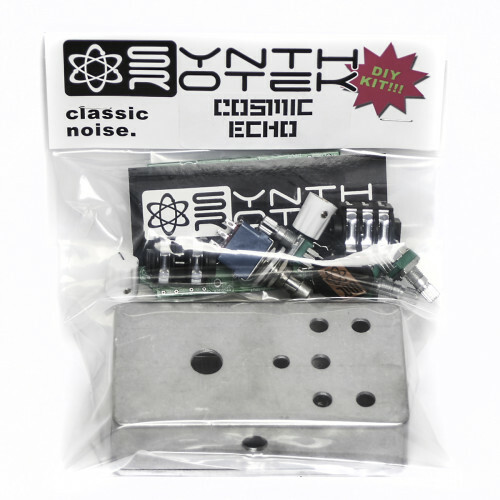 Great for adding rhythmic feedback and other strange sounds. The Zone amount can be adjusted by an internal trim pot. – Pedal has a slight volume drop. 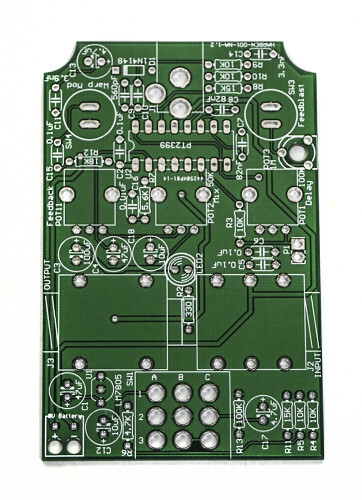 For Version 1.4, is R11 8.2 k, like it says on the BOM, or 15 k, like it says on the board? Always go by the BOM on these baddies, please. You’ll notice the Assembly Instructions have a nice reminder to do so at the top. So thanks for checking before just building!